As a bus driver, Pursottam spent his days on the road, driving hours back and forth between the Nepali districts of Surkhet and Dailekh. The days were long, but Pursottam was thankful for a way to earn money and provide for his wife and two children. One day at work, Pursottam felt a strange pain in his hands. It felt like nerve pain and quickly spread to other areas of his body. The pain became so intense that Pursottam struggled to finish his drive. Anxious that the mysterious condition would affect his ability to work, Pursottam began searching for a cure. He spent much of his savings visiting neurologists in his community, but no doctor could provide a diagnosis or effective medicine. Meanwhile, Pursottam’s symptoms grew increasingly severe. His fingers and feet had gone numb. He’d lost all sensation in his right eye. Even his skin’s pigmentation and facial structure had begun to change. The sight of his face altered struck fear in Pursottam and he became too ashamed to leave his house. Fortunately, his prayers were answered the day he heard about INF’s hospital in Banke. Pursottam at the Shining Hospital in Banke, Nepal. 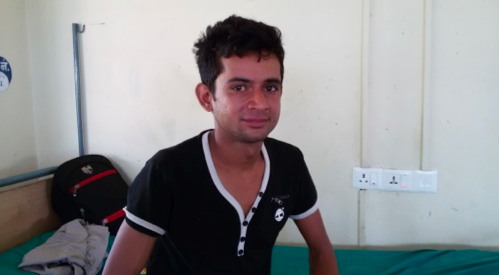 Pursottam journeyed to the hospital where he was diagnosed with leprosy and given medicine. Gradually, his nerve pain lessened and his face returned to its regular shape. Pursottam felt relief to finally understand his illness, but he also received counselling sessions to help him cope with the distress he experienced. With time, Pursottam’s health, hope and dignity were restored. This work is possible because of compassionate people like you. Help support those who are suffering from illness to uphold God’s promise of abundant life for all. Banner photo: outside of the Shining Hospital in Banke.